« Sorry, Colonel Sanders: The Fricadelle takes it! Don’t let the husband fool you. 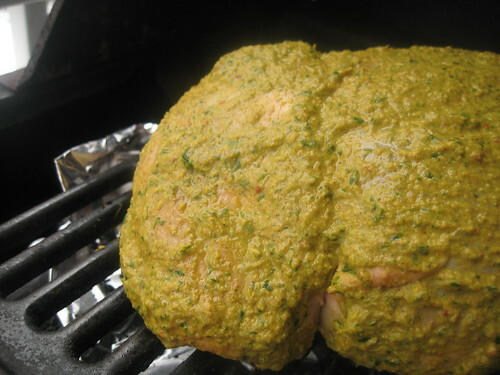 He likes to claim that this recipe was an attempt at some “weather voodoo” — meaning, if he roasted a big hunk of meat on our grill, he would convince the weather gods to raise the mercury a notch or two. The husband likes to grill. The husband likes meat. The weather has nothing to do with it. In fact, if anything, he angered the weather gods by roasting a spring lamb on a day when the DC area received three inches of snow — and through his meat-searing antics inspired them to drop a one-inch layer of ice that very evening. So much for weather voodoo — or at least my husband’s credentials as a warlock. But about that lamb… that is another story. Lovingly tending that big hunk of meat on that snowy day, my husband coaxed from our grill quite a tender piece of eating. Subtly spiced, rosy pink and moist, for a moment I might have imagined spring — if the cold gust of air from the open door leading to the grill hadn’t snapped me out of it. Now, as a woman about eight months pregnant, I appreciate a good piece of red meat… and I am always hungry. 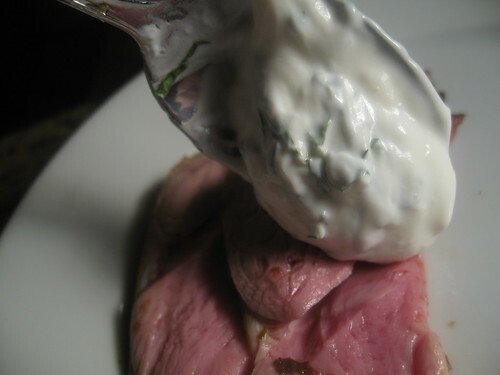 And I warn you one other thing may have clouded my judgment: The delicious cool, creamy and tangy yogurt/sour cream sauce that my husband whipped up to accompany the lamb. Let me advise you: Don’t eat lamb without it. 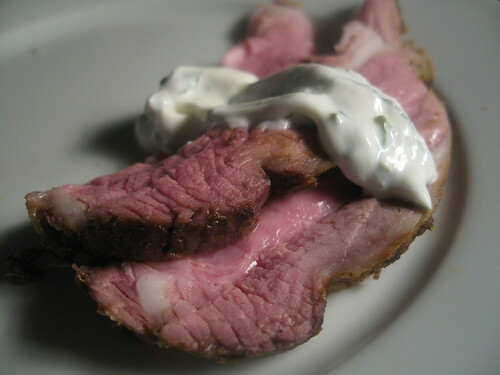 That said, however, I think that, pregnant or not, yogurt sauce or not, this lamb will satisfy those meat cravings you’ve been fighting. It is so, so good. So, go ahead, attempt this recipe. Maybe you’ll have better luck altering the weather in your region with a meat sacrifice to the weather gods. And, if not, at least you’ll have a full belly to placate you while you burrow down into your blankets. So, it’s winter. And believe me, I’ve noticed. Here in our nation’s capitol, we saw a historic new president and watched people freeze as they celebrated. Indeed, we’ve seen what I feel is an unusual string of below freezing weather. The Potomac has consistently had a sheen of ice over it. In other words, it has been too cold, too often. Now, you folks who live in more northern parallels — you are tougher than me. I don’t care. I am already ready for spring and it’s just now February. So, my solution is to find a big hunk of meat and roast it outside. Forget Groundhog Day, this is willing spring through the sheer force of meat. Hasn’t worked yet, but the results are a very delicious roast with lots of spices and the strong red meat flavor of lamb. If you are not quite as daring as me (because your grill isn’t three feet from your back door), then you can just as easily do this in the oven. This is another one of my favorite kinds of recipes too because you prep it, forget it and do other things. 1. 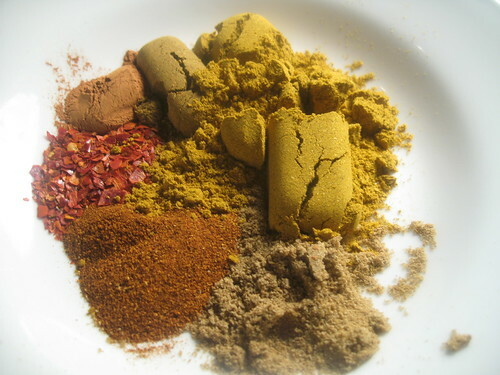 Add all the dry ingredients and the spice mix into a blender or food processor. 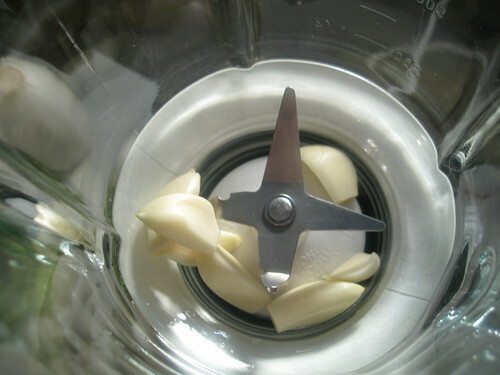 Slowly add both the wet ingredients until a paste is formed. You may need to modify the amount of liquid suggested. 2. 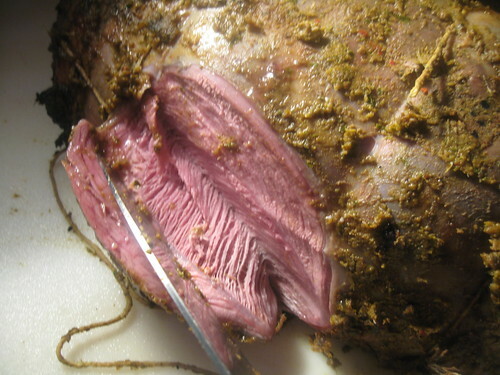 Coat the leg of lamb in the paste. 3. Preheat oven to 325. 4. Roast for approximately 90 minutes or until the meat reaches an internal temperature of 135-140F at the thickest point. This is medium and you can safely eat it at cooler temperature, but this is our suggested temperature. 5. Cover with aluminum foil and let rest for 20 min. 1. Combine all ingredients and mix thoroughly. Adjust seasoning to taste. Wow! I just sent this recipe to my boyfriend – a Columbus native who’s now in D.C. I’m heading down there next week for our anniversary, and maybe I’ll get to try this! Mmmm. You may have prepared this as a lighthouse for warm weather but it looks to me like the perfect dinner for a cold Saturday. Just ate a butterflied leg of lamb. Great on the bbq. mmmmmmmm Lamb is soo good! 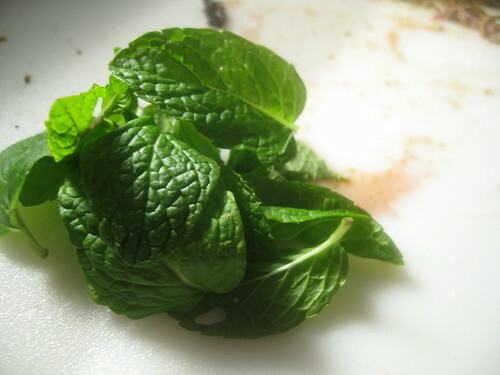 Be sure to post your restaurant reviews at http://tinyurl.com/26okadh !!! Used this recipe for a 4.4 lb boneless leg. I made the paste a little soupier than I’d have liked, but the flavor was just fantastic (and the leftover paste was a great sauce for some udon noodles!). Pulled the roast out at 130 F and it was just amazing. Thanks for sharing!